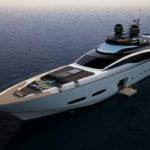 A collaboration between Officina Italiana Design, the studio founded by Mauro Micheli in collaboration with Sergio Beretta, the Strategic Product Committee and the Ferretti Group Engineering Department, the Riva 110’ promises to be a flybridge of boundless beauty and unprecedented elegance. The design of the hull has been fully refreshed and is now almost 109.1 feet (34 metres) in length, and a width of over 22 feet (7 metres). As on the larger yachts, the central zone serves to regulate the flow of crew and guests by keeping their circulation routes separate. To the left is access to the guest area below deck and the main deck master suite. To the right is access to the bridge, the galley and the below-deck crew cabins. Guest accommodation is comprised of 4 VIP cabins with vanity tables and en-suite bathrooms. The starboard VIP cabin forward has twin beds and may accommodate, on request, an additional Pullman bed. The sundeck of the Riva 110’ is striking in its sporty and innovative design. 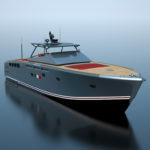 In the stern, the furnished open air sundeck is enclosed by a mahogany handrail finished with stainless steel and polished carbon fibre. There is also a cocktail bar with two stools and an informal dining area with C-shaped sofa, all naturally illuminated thanks to a glass skylight in the hardtop roof. The helm station is situated on the right side, with co-pilot seats on the left. Alternatively, the owner may opt for a Jacuzzi with sliding integrated sun-pad covers. 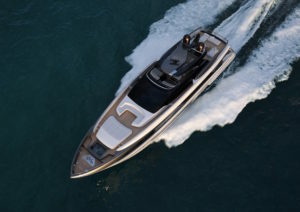 This conceals both the Jacuzzi pool and the mooring stations, offering guests the ultimate in refinement. On this model, the area is equipped with a practical stowage compartment.